The static getColor() function shows the dialog, and allows the user to specify a color. This function can also be used to let users choose a color with a level of transparency: pass the ShowAlphaChannel option as an additional argument. When pressing the "Pick Screen Color" button, the cursor changes to a haircross and the colors on the screen are scanned. The user can pick up one by clicking the mouse or the Enter button. Pressing Escape restores the last color selected before entering this mode. See also QColor, QFileDialog, QFontDialog, and Standard Dialogs Example. This enum specifies various options that affect the look and feel of a color dialog. QColorDialog::ShowAlphaChannel 0x00000001 Allow the user to select the alpha component of a color. 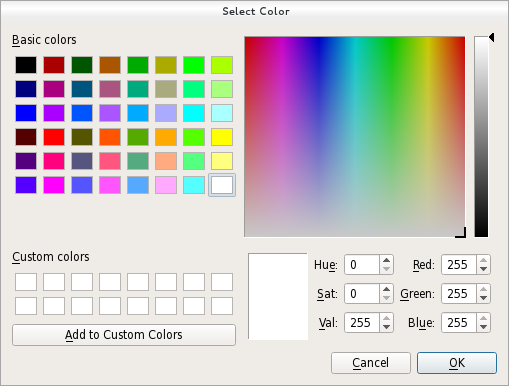 QColorDialog::DontUseNativeDialog 0x00000004 Use Qt's standard color dialog instead of the operating system native color dialog. The ColorDialogOptions type is a typedef for QFlags<ColorDialogOption>. It stores an OR combination of ColorDialogOption values. See also options, setOption(), testOption(), and windowModality(). Constructs a color dialog with the given parent. Constructs a color dialog with the given parent and specified initial color. This signal is emitted just after the user has clicked OK to select a color to use. The chosen color is specified by color. See also color and currentColorChanged(). This signal is emitted whenever the current color changes in the dialog. The current color is specified by color. Note: Notifier signal for property currentColor. See also color and colorSelected(). Returns the custom color at the given index as a QColor value. Pops up a modal color dialog with the given window title (or "Select Color" if none is specified), lets the user choose a color, and returns that color. The color is initially set to initial. The dialog is a child of parent. It returns an invalid (see QColor::isValid()) color if the user cancels the dialog. The options argument allows you to customize the dialog. Opens the dialog and connects its colorSelected() signal to the slot specified by receiver and member. Returns the color that the user selected by clicking the OK or equivalent button. Sets the custom color at index to the QColor color value. Note: This function does not apply to the Native Color Dialog on the macOS platform. If you still require this function, use the QColorDialog::DontUseNativeDialog option. Sets the standard color at index to the QColor color value. Changes the visibility of the dialog. If visible is true, the dialog is shown; otherwise, it is hidden. Returns the standard color at the given index as a QColor value.